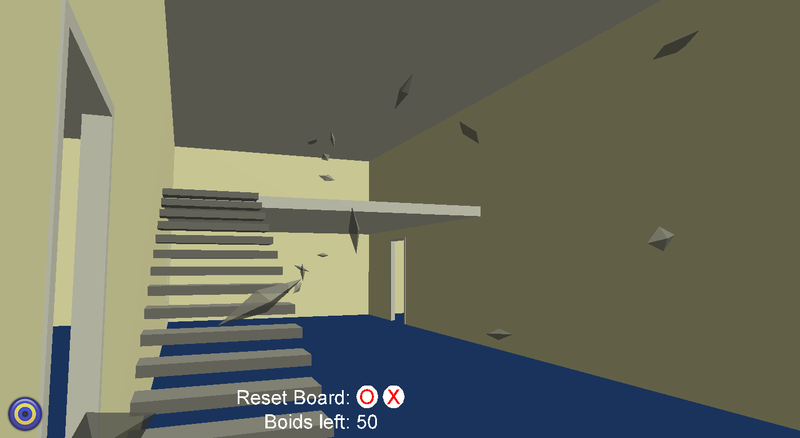 You will need to install the BS Contact VRML viewer before you can run the simulation. It can be found here, where you should download the latest version of BS Contact. You will need to give a name and email to download the player. Once you have this installed, click here to run the simulation (it appears certain internet browsers have problems with this, you may need to open it more than once to make it display properly or use a different browser). If that version runs slowly on your computer this version with fewer boids should work better. Alternatively, you can download a zipped version of the simulation here to run in the BS Contact player. Open Project.wrl to start the simulation. This includes all source code. Contact me for permission before modifying, copying or using it in any way other than running it or looking at it.